Set in Luton, featuring personal injury lawyers and conventionally played, Nick Payne’s The Same Deep Water As Me at first glance appears to have an underwhelming premise to follow his sparkly original and hugely successful Constellations. However Nick Payne, despite young in years, has already begun to establish a formidable reputation as a playwright with an ear for the patter of the everyday voices and so it proves with a solid follow-up to one of the more original plays of recent years. Payne’s talent goes farther than the mimicking of the everyday, it is also possible to see him channelling the distinctive voices of the late 20th century. There was a Stoppardian verve to the writing that grounded Constellations and it is impossible to watch The Same Deep Water As Me and not recognise the muscularity of Mamet lying below the surface. It is rare, in British playwriting, to find someone who can so convincingly evoke the language of those that may be labelled the working middle-classes. His characters seem to spring from a previously untapped well of working professionals; strong working-class roots but perhaps the first to make use of widening university provision. By and large Payne writes characters who are near-invisible on the stage, and who are often routinely talked-down and patronised by those who see themselves as the guardians of culture. They do not have a socialist chip on their shoulders but they also are not part of the institutional elites; in short they are not political but are fiercely individual and rarely do playwrights try to illuminate the inner-lives and desires. At times Payne’s writing is reminiscent of a well-crafted stand-up routine; turning ordinary lives into something faintly surreal and highlighting the hidden absurdity’s in established routines. Rather than grotesque caricatures, Payne finds humanity in the everyday. A repeat call-back to Greggs – a very modern class touchstone – under Payne’s gentle probing reveals glimpses of a hidden world where relationships develop and life experience is shared. We find the quality of a steak slice is quantified and rated with the same precision that foodies reserve for bread and olives. The shadow of Mamet is impossible to ignore and these is reinforced through both plot and structure. The ambulance-chasing, insurance scams of In The Same Deep Water As Me operates in a similar moral universal to Glengarry Glen Ross. They both operate within a macho-office-based culture; they are full of people who are not operating at the margins but are still having to scrap and scramble to survive. Criticisms can be levelled at the play and these are mainly focused on its rather formulaic structure – again echoing Glengarry Glen Ross. The structure is partly responsible for an over-reliance on the use of blackouts to transition between scenes; it is a jarring effect and has a tendency to jolt the audience out of some of the show’s most poignant moments. During the second and third acts there is a particularly long black-out as the set must revert from courtroom to office that has the unfortunate effect of releasing much of the tension that had built up. As a result the final dénouement is undermined and reduces the effectiveness of the last scenes. The ending feels a little flimsy in comparison to what has come before. Mamet, one feels, would not let his characters off that easy; there would be more savagery but there is still clearly an optimistic streak in Payne, who allows a glimmer of light to emerge from the gloom. As a result it feels as if there are a few loose-ends that are conveniently, if rather perfunctorily resolved in order to allow for the possibility of a more upbeat ending. The cast is uniformly good, as you would expect of a Donmar production, and Mark Wooten proves to be something of a revelation on the stage; a bouncy, forceful bundle of energy –convincing as the sort of person who had been a memory from school that had, until now, been happily forgotten. 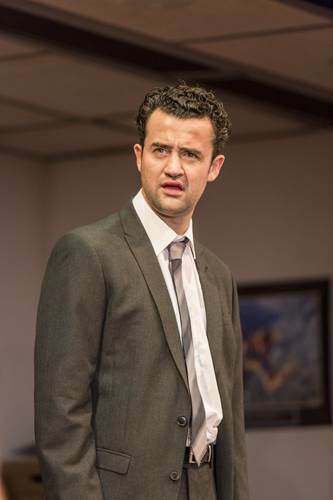 Daniel Mays is terrific as the lead lawyer; he has a slightly haggard hangdog face that is full of a life left unexplored, of chances not taken and dreams left unfulfilled, and underlying all is the self-awareness to have realised this. The supporting cast are also excellent – each has their own slightly absurdist take on a stock character. They are not boundary pushing creations but they are consistently funny and enabled to function by seeming as if they are well-rounded characters with a life of their own. The ‘other’ involved in the accident takes particular credit as someone who initially appears to be a classic farcical creation but who unravels on the witness stand into someone with her own hidden worries and concerns. Constellations was such a big hit for a playwright at such a young age – similar to Lucy Prebble’s breakthrough with Enron – that the follow-up was always going to be tricky. So much expectation needed to be managed that it is perhaps unsurprising that Payne retreated to a much more rigid play with the structure acts as a psychological safety net. Constellations seemed to fizz with the energy of an up-and-coming playwright unleashing his creative forces. The Same Deep Water As Me arguably lacks this freshness but in many ways it is a more solid and less problematic work. Constellations maybe a diamond but it is a flawed one; the play is brilliant but is forced through its chosen form. The Same Deep Water As Me is closer to a tempered steel; the characters moulded into shape and the play fitted around them so that as a result everything appears more grounded and real. The play is seemingly unlikely to catch the audience in the same way as Constellations. For many regular theatre goers it may seem a little staid, possibly old-fashioned, and it doesn’t have the quirkiness and buzz to reach out to those who go less regularly. However for those interested in theatre, it is another opportunity to watch one of the most exciting young playwrights continue to expand their range.